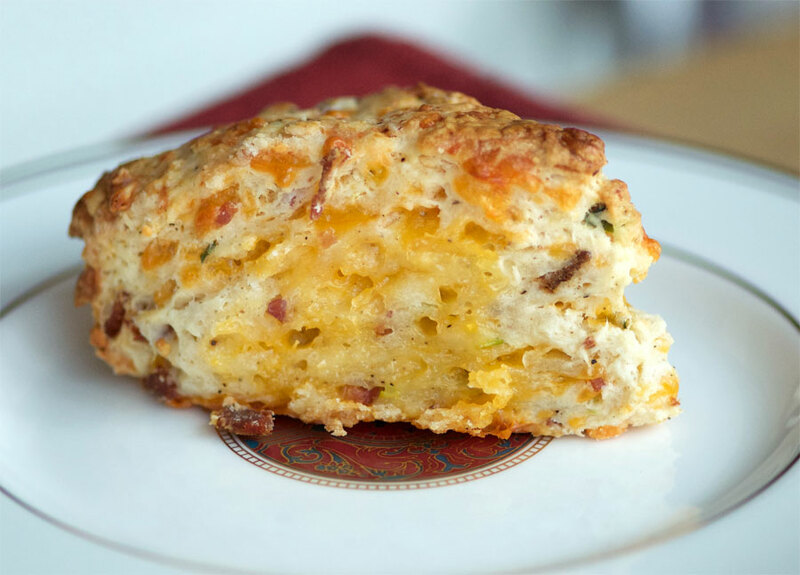 Savoury, crisp, buttery and melt-in-your-mouth—this is an excellent scone I love to serve with my fav butternut squash soup. These really hit the spot served warm with a little extra butter served on the side, because you can really never have too much butter! 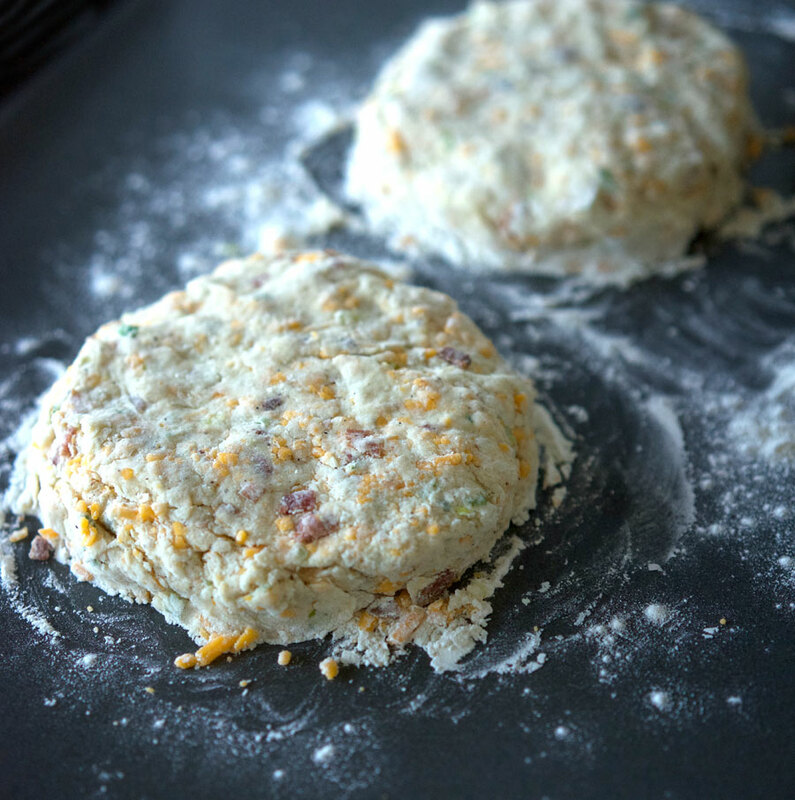 The green onions round out the bacon and cheddar and add something a little unexpected to these scones that really takes them over the top. 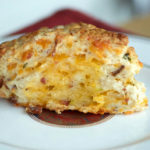 Based on Emeril’s Bacon Cheddar Cheese Scone recipe, I follow the original pretty closely except I typically use half-and-half cream rather than heavy (whipping) cream. I also prefer to cut in the butter first, as I find when trying to do this with the cheese and the onions at the same you aren’t able to blend the butter with the flour as well as I would like for optimal dough cohesion. Above you can see the cheddar and green onions going in to the dry ingredients—you can see how the butter has already been cut in. 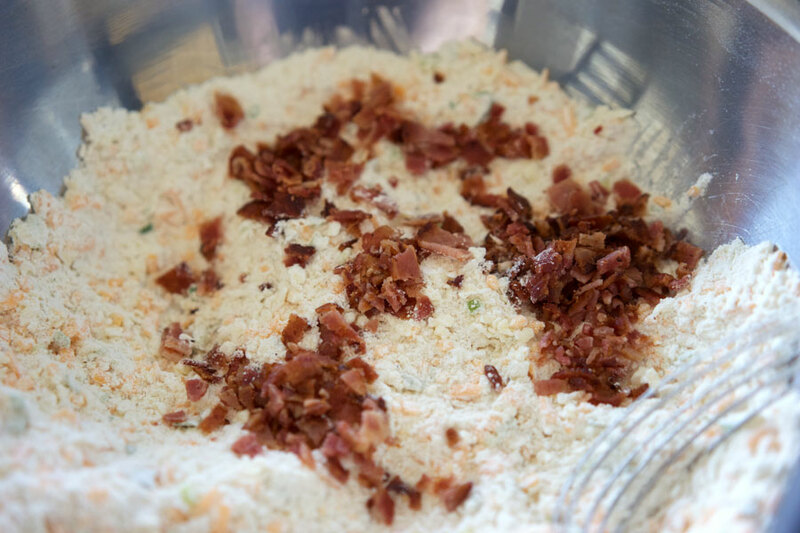 Once the cheddar and green onions are well integrated, I add the bacon which will break up a bit more as you mix it in, which is just fine. Once you’ve added the bacon, the cream is added and you can lightly work this into a dough. You need to knead the dough enough that you can’t see any more areas of flour and it’s just holding together. You don’t to overwork it. Then you divide the dough into two even halves. Either on a floured countertop, or directly on the prepared parchment, press each half into a flattened disc about 7″ wide. The disks need to be placed onto a parchment lined baking sheet. 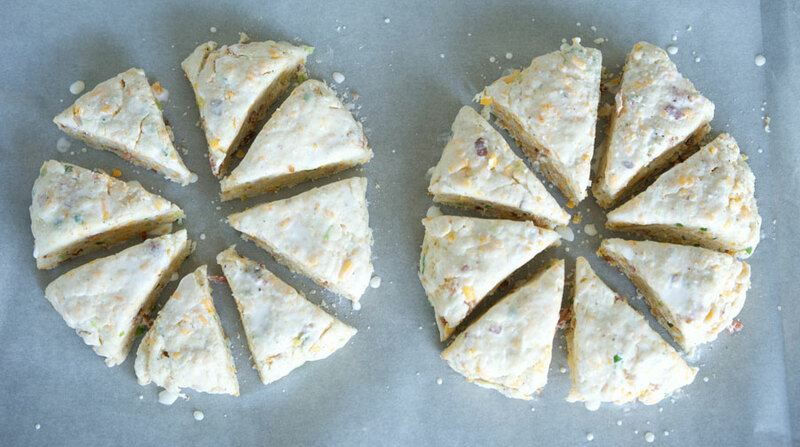 Cut each disc of dough into eight wedges, making 16 scones. Brush on some additional cream to create a lovely golden colour on the baked scones. Warm out of the oven, the scones are crisp, buttery and flakey. At the same time they aren’t too heavy and I find the texture to be somewhat light for a scone. This recipe is a real keeper, I hope you’ll give it a try and let me know how it turned out! 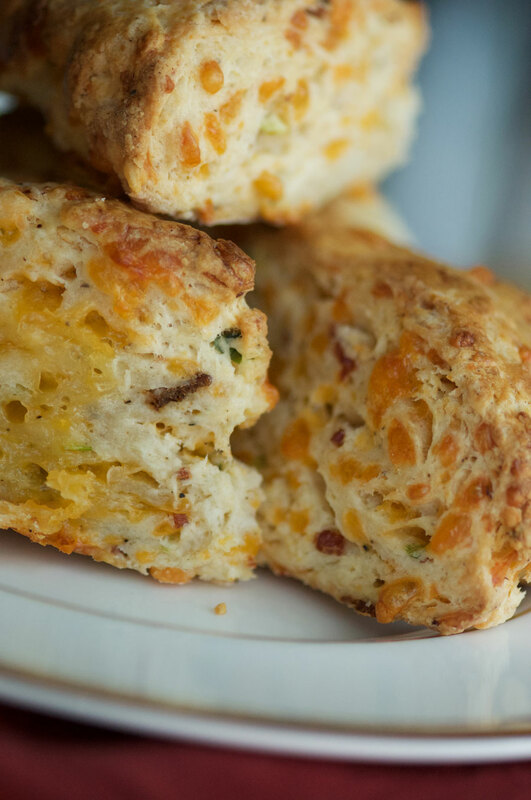 Savoury, crisp, buttery and melt-in-your-mouth—an excellent scone I love to serve with my fav butternut squash soup. Prepare a large baking sheet with a sheet of parchment paper. Preheat oven to 400°. Cook bacon strips until they are crisp (I like to place bacon on a foil-lined baking sheet and bake at 400° for 15 minutes, flipping half-way through). Drain on paper towel dabbing off excess grease. Roughly chop and set aside. In a large bowl, combine flour, baking powder, sugar, salt and pepper. Cut in the butter with a pastry cutter or two knives until the texture consists of fine lumps. 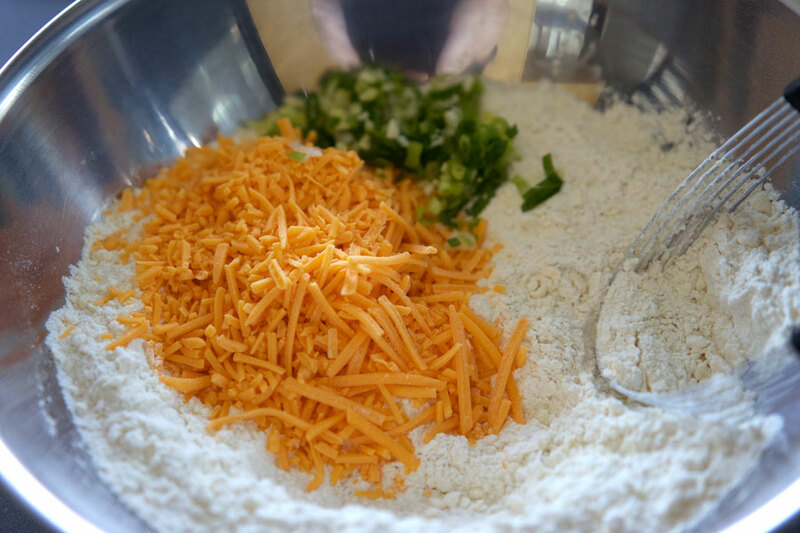 Add cheese and green onions, cutting the cheese into the flour mixture. Add bacon and combine. Add 1 cup of cream and work with your hands to mix into a sticky dough. Combine just until flour isn't visible and the dough holds together, don't overwork it. Split dough into 2 equal halves. Flatten each half into a circle on the parchment lined baking sheet, about 7" in diameter. Cut each circular disk into 8 wedges. Spread out the pieces to leave a 1/2" space between them. Brush the tops lightly with the remaining cream. Bake until golden brown, 20–22 minutes. Remove from the oven and serve warm.